We have a plant stand in our home from the Bombay Company, and the lines of this stand have always appealed to me. However the construction is somewhat lacking, i.e. the top plate appears to be veneered MDF, the joints are secured by bolts and the lower plate is secured by screws. To me, these methods are unacceptable. 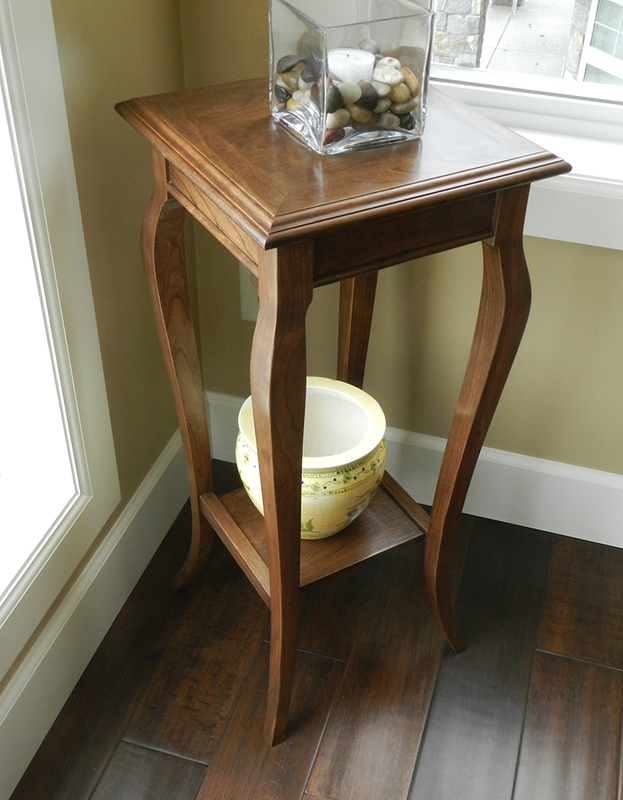 In this instructional article, we will describe how to build a new plant stand using improved materials and stronger joinery using our multiple dowel system and 100% dowel construction to build the project. Great care has to be taken in constructing and shaping the cabriole legs, however the procedure appears more difficult than it actually is. 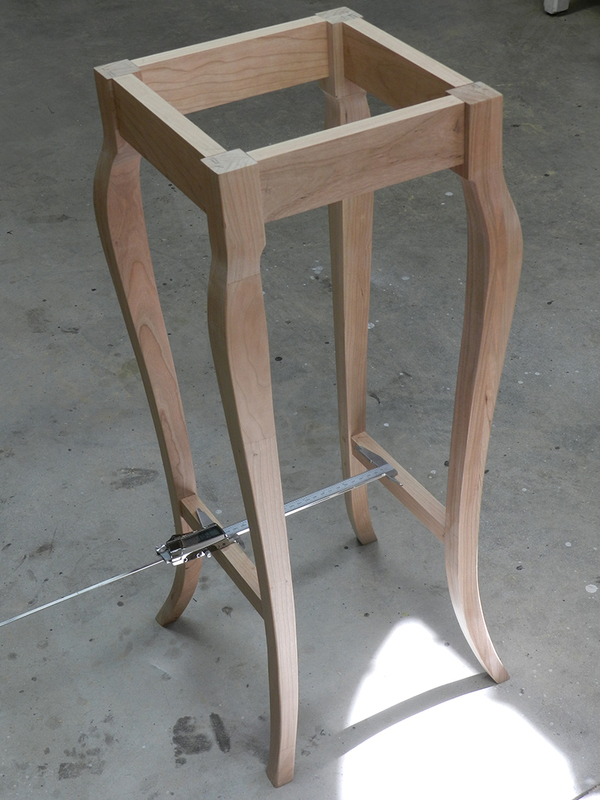 The finished plant stand built in this instructional article with 100% dowel construction. 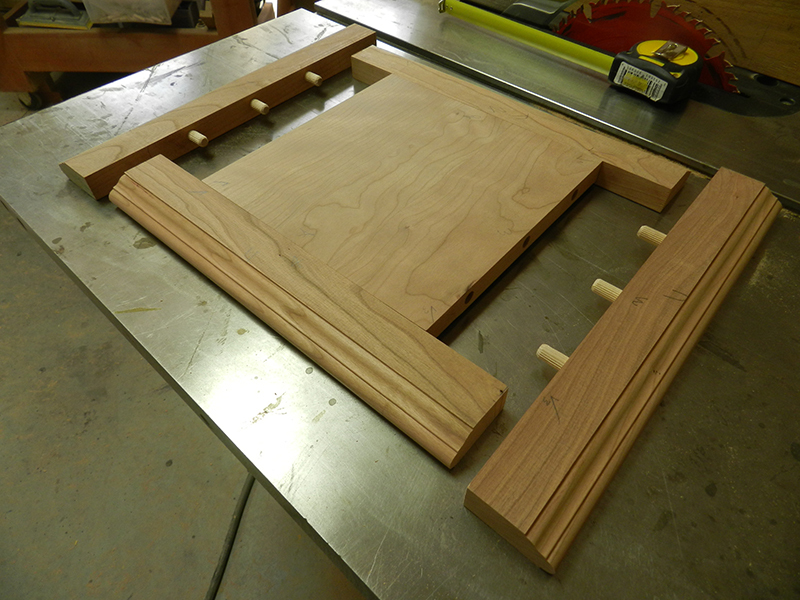 The legs are 27 1/2 inch high and since I don't have 2 to 3 inch solid cherry, it is necessary to use a lamination. I am using 3 – 7/8" x 2 1/2" x 32"
It is necessary to mill the 3 components the exact same width, i.e. 2 1/2", this for 2 reasons: (1) Glue and clamp. 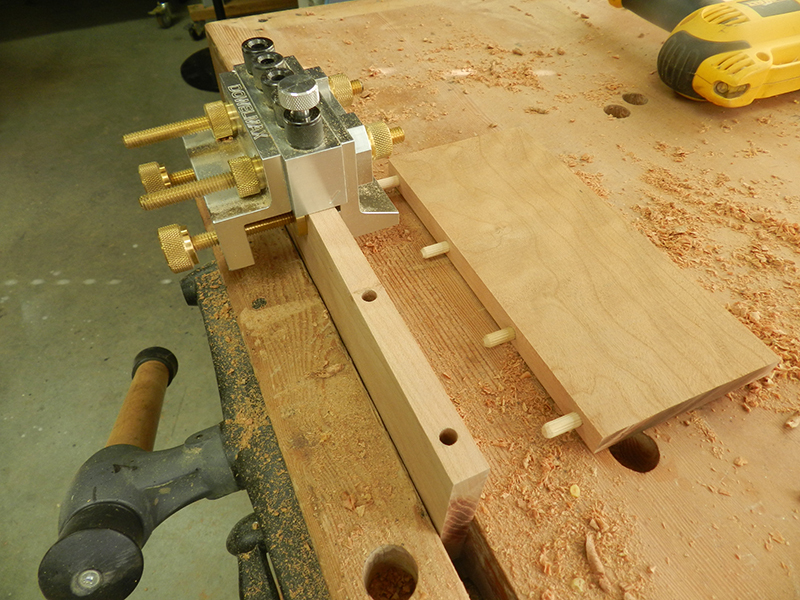 I begin by clamping the edges of the 3 pieces in order to prevent these components splaying or skewing when clamping the glued faces. (2) This simplified the milling and truing procedures after curing. The initial cuts are done on the table saw and finalized on the planing machine. Prior to milling the square section, use a machinist's set square to ensure that the table saw blade is absolutely vertical and at 90 degrees to the bedplate. I have cut a template for the cabriole legs from 1/4 inch hard board; this to ensure all the compound curvatures will be almost identical. Note that although the design incorporates various compound curves, one template only is required. Cabriole leg template clamped to leg work piece to mark the shape outline. Lightly clamp the template to the work piece as shown in photo. The template is used on 2 faces of the work piece, and it is important to note that in order to obtain the correct curvature, the edges of the template eventually forming the joint surface, must meet at the same corner (refer to photo). Mark the 2 profiles meeting at the same corner, and then cut the legs to length. Cabriole leg template used on two faces and aligned to the same corner. 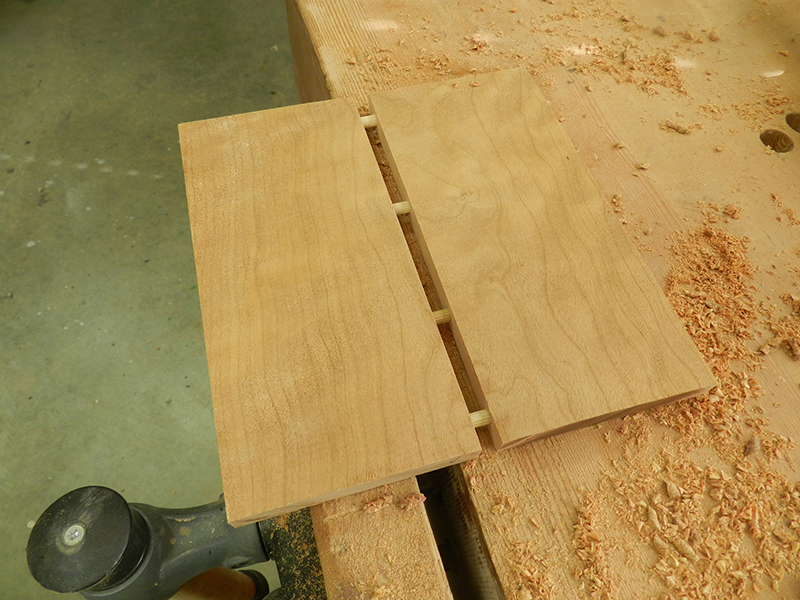 It is of course important that the leg lengths are identical and to that end I use the table saw fence and the sled. Use a machinist's square to ensure the table saw blade is absolutely perpendicular with the bed plate, and using the sled, cut one end square and true. Then reverse the block, set the fence to exactly 28 1/2 inches (the exact length of the leg is 27 1/2 inches). Use a small block exactly 1 inch wide and insert between cut end of the fence. Move the sled to a pre-determined position (related to all 4 legs). IMPORTANT: The 1 inch block must be removed before the cut is made. Once the rough shape has been made on the band saw, we begin the fairing process. 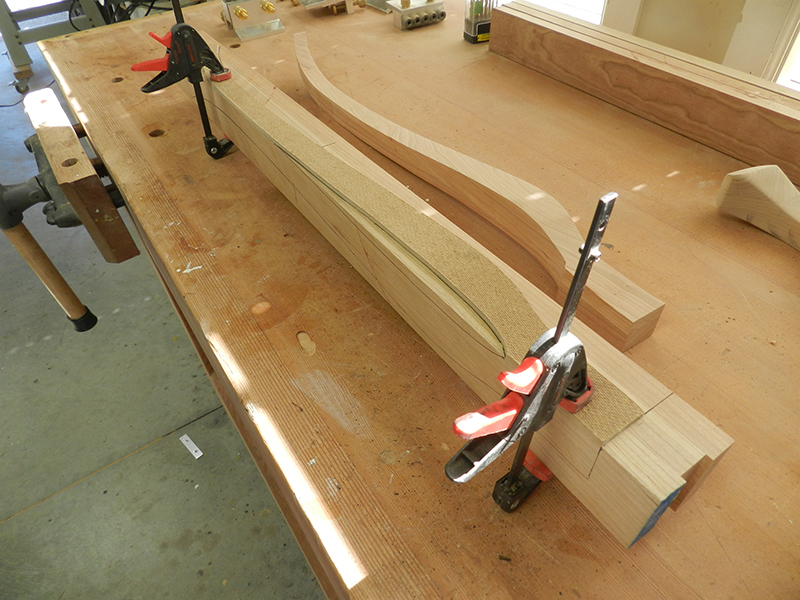 I use a spoke shave for fairing the contours (an excellent tool for this application). The next step is rather unorthodox, however it works very well. 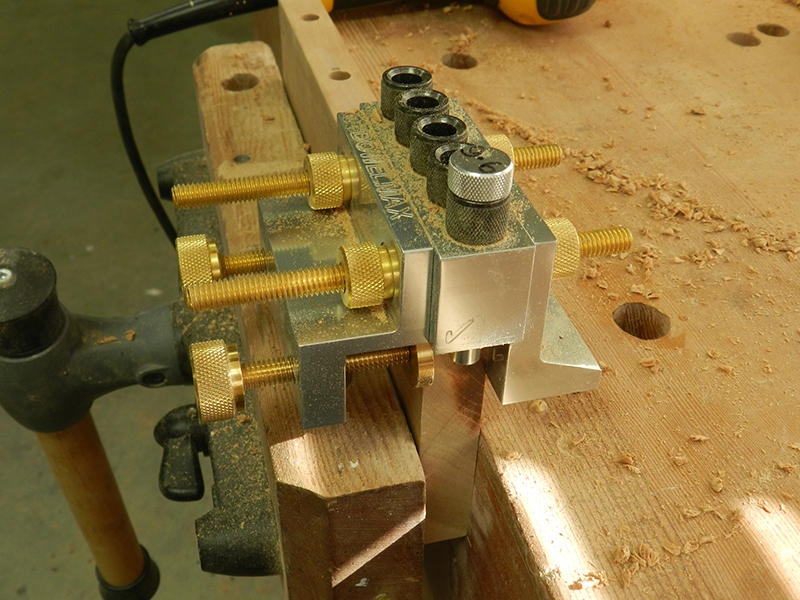 I lightly clamp the belt sander in the vice, and using 150 grit, smooth down all the compound curves. Following that, I use a 6 inch orbital sander to fine tune these curves, then finalize by hand using first 120 grit and then 220 grit sand paper. With reference to the previous video, as a consequence of the curvature of the legs, it is difficult to secure the leg in the vice. I therefore use gasket material and blocks, in conjunction with a bench top vice grip, to secure the leg whilst drilling. With respect to the top rail joint: in order to avoid fouling of drill holes, I adjusted the drill stop collar to allow 5/8 depth into the leg and 7/8 depth into the rail. 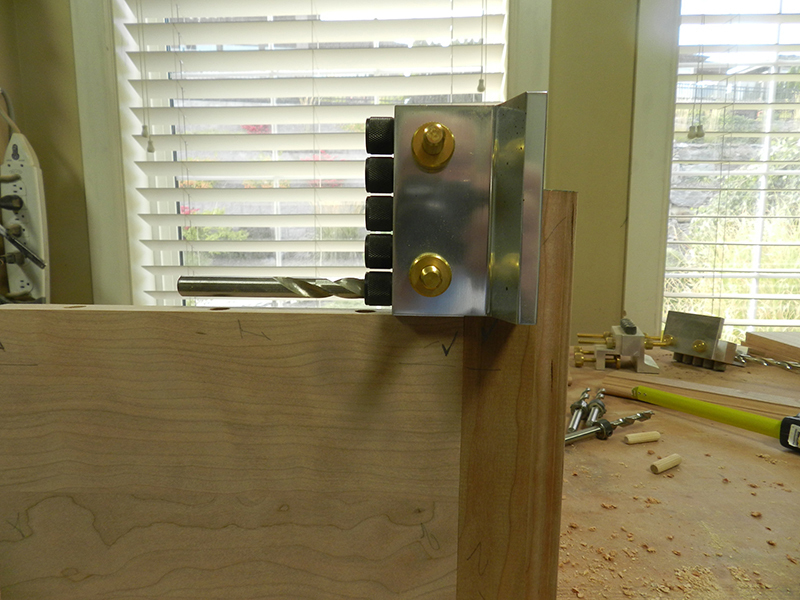 Dry fit the 4 upper rails and 2 lower rails, lightly clamp and square up components to determine width of lower shelf. 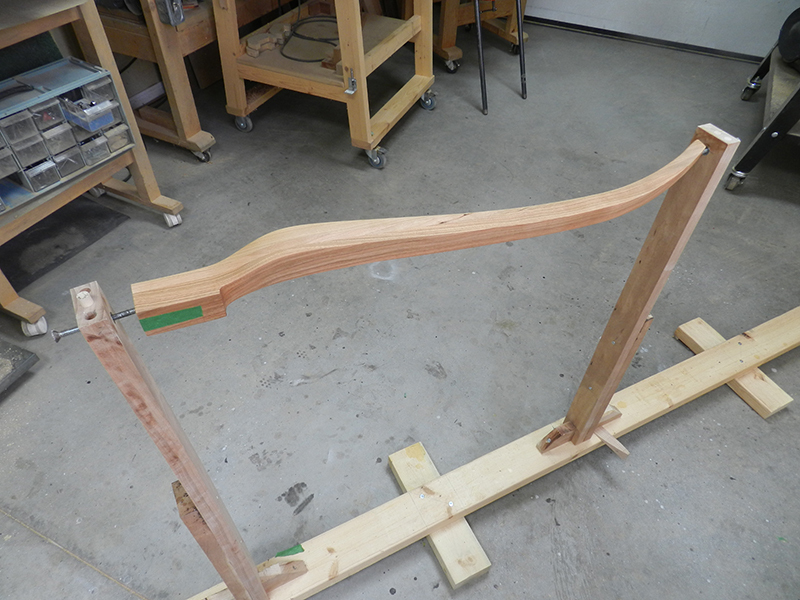 Legs and rails dry-fitted to determine the width of the lower shelf. The shelf measures 1/2 x 8 x 8inches. 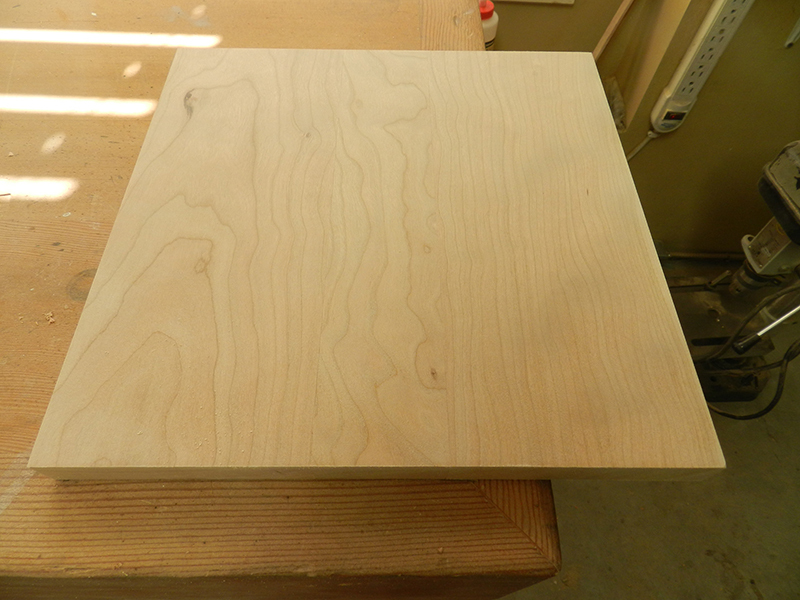 I found a piece of 12 inch cherry which seemed ideal, however when cutting the board, I discovered it was badly cupped and bowed. I decided to remove the distortion by cutting down the centre of the board, realigning the edges and refastening using 4 x 1/4 inch dowels. The shelf is 1/2 inch thick so in order to centre properly it was necessary to install the 1/8 inch spacer directly to the reference bracket. Dowelmax with 1/8 spacer installed to center on half inch thick shelf. 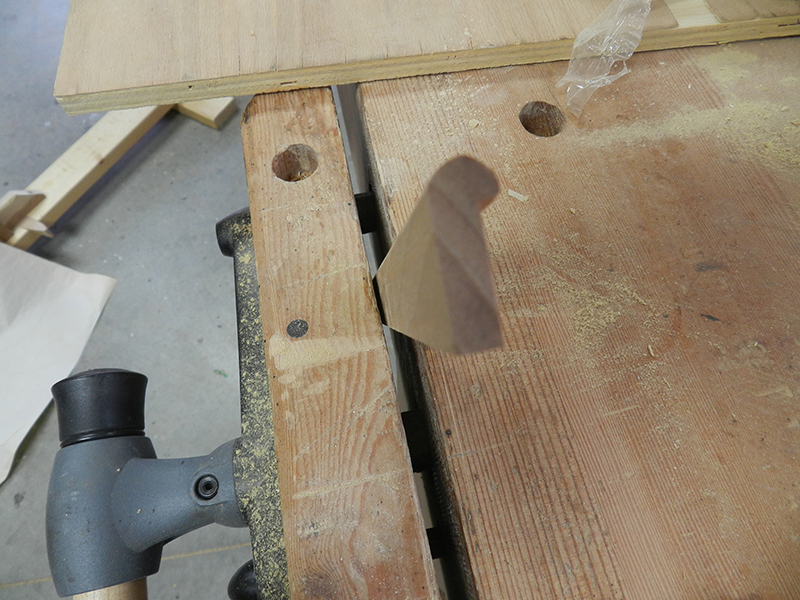 The lower shelf work piece cut into two and rejoined with 1/4 inch dowels to remove cup and bow. The lower shelf work pieces dry fitted and closed. The length of the two lower rails is 7 7/8 inch and the width of the lower shelf is 7 3/8 inch, this of course leaves a differential of 1/4 inch at each end. 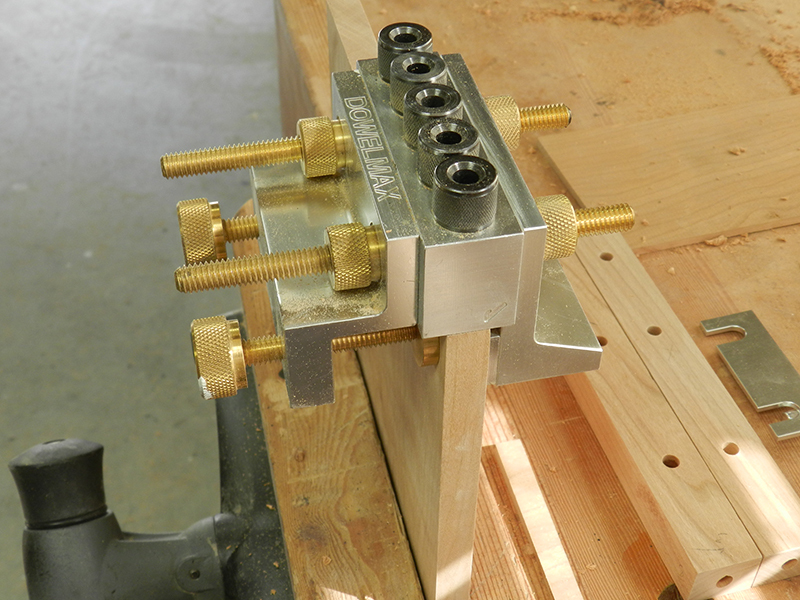 Take the 2 rails and lightly clamp them together with the ends fair. Measure in from the left hand side 1/4 inch and scribe a mark on both faces. Use these marks to align Dowelmax. Lower rails clamped to shelf to locate alignment marks for Dowelmax. 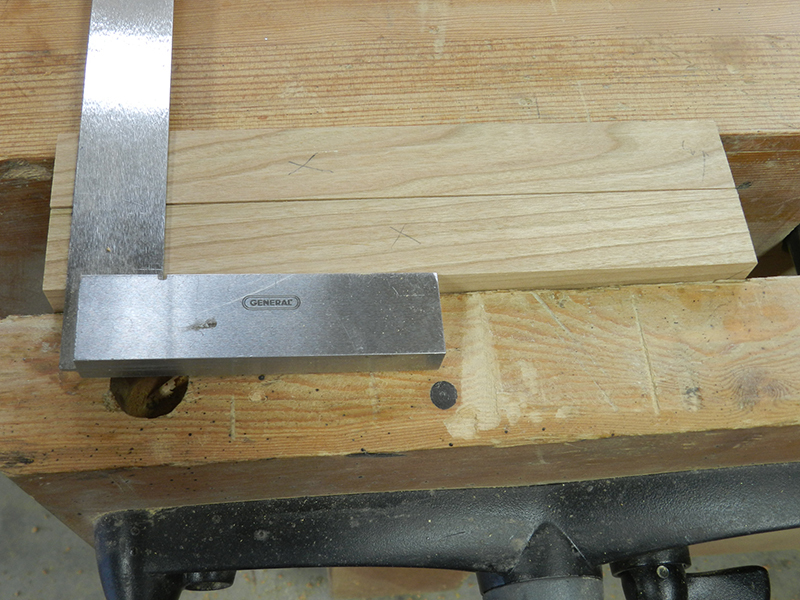 Using a set square to extend the alignment marks for Dowelmax on the lower rails. NOTE: When aligning this way, ensure that the scribed line is on the surface to be drilled on both joints. Align Dowelmax to each line. 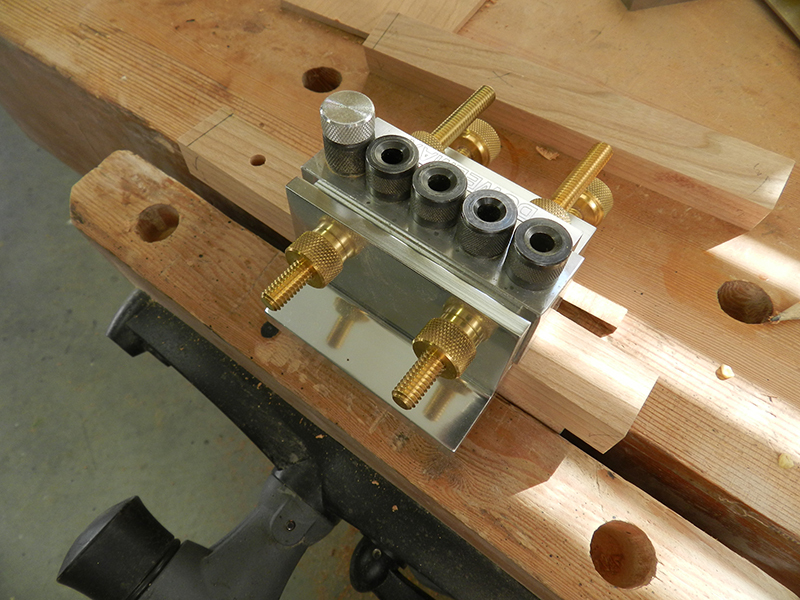 Use the 1/8 inch spacer to centre on the 1 inch rail, align to the pencil line and drill through 2 and 5. 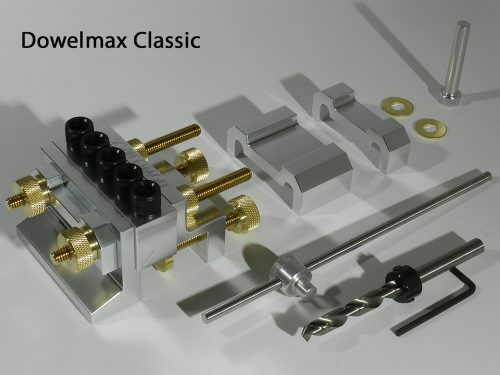 Loosen Dowelmax, move device along, insert indexing pin in last hole and again drill bore 5. Repeat the process on the 1/2 inch shelf, carefully using the check marks and X's. Dowelmax index pin used to extend drilled bores along the length of the lower shelf rails. NOTE: Calculation for centring on the 1/2 inch wood: 1/2 inch ÷ 2 – 3/8 = minus 1/8 (a negative reading). Use the 1/8 slotted spacer and install on the face of the reference bracket. In other words: reduce the span of the Dowelmax rather than the usual process of increasing the span. 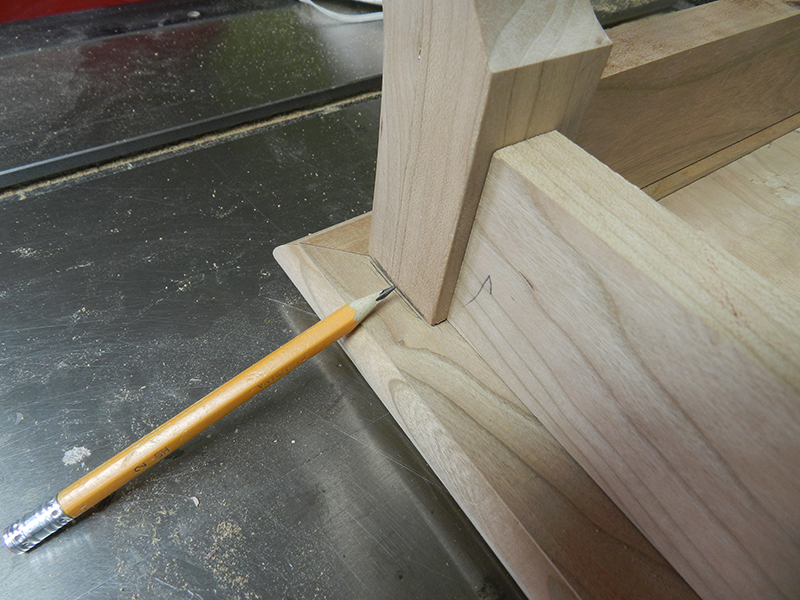 To avoid cutting dowels to required length, drill 5/8 inch into shelf rail and 7/8 inch into shelf. Dowelmax with 1/8 spacer used to center on 1/2 inch thick lower shelf work piece. The full measurement of the plant stand top will be 12 1/4 inch x 12 1/4 inch. This provides an overlap all round of 1 inch. The centre core of the top plate will be 3/4 x 10 1/4 x 10 1/4. The perimeter rail which will be mitred, will be 7/8 x 2 x 12 1/4 inch. Part of the perimeter rail will be recessed to allow an overlap of 1/8 inch when the top plate is in position on the stand. To construct the centre plate or core of the top, I am using 3 pieces of cherry, 2 of these are 3/4 x 4 1/8 x 10 1/4, and 1 strip will measure 3/4 x 2 x 10 1/4 inch. 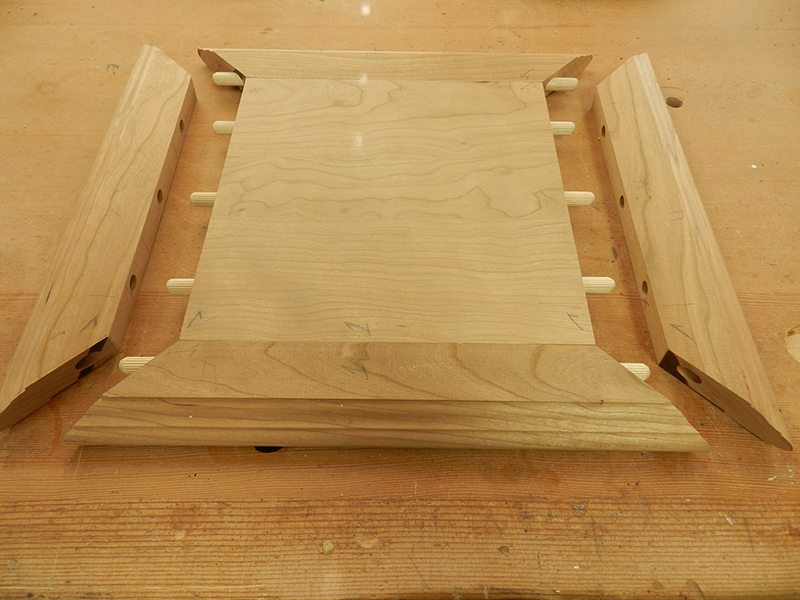 These plates will be joined at the centre using 8 – 3/8 x 1 1/2 inch dowels. Insert your reference marks and drill sequentially from check marks to opposite end. In this case I used the indexing pin for quick alignment to the end. Drill through guide 3, move Dowelmax horizontally, insert indexing pin and drill through guide 5. Repeat that process twice for the 2 remaining holes. Dowelmax index pin used for quick alignment to the end of the top plate work piece. I don't have a jointer to prepare the edges prior to edge joining the 3 - 3/4 inch strips, so I use the table saw, making small 1/32 inch cuts, constantly rotating the pieces until a perfect match is attained. See photo of 3/4 x 8 5/8 x 8 5/8 centre core. 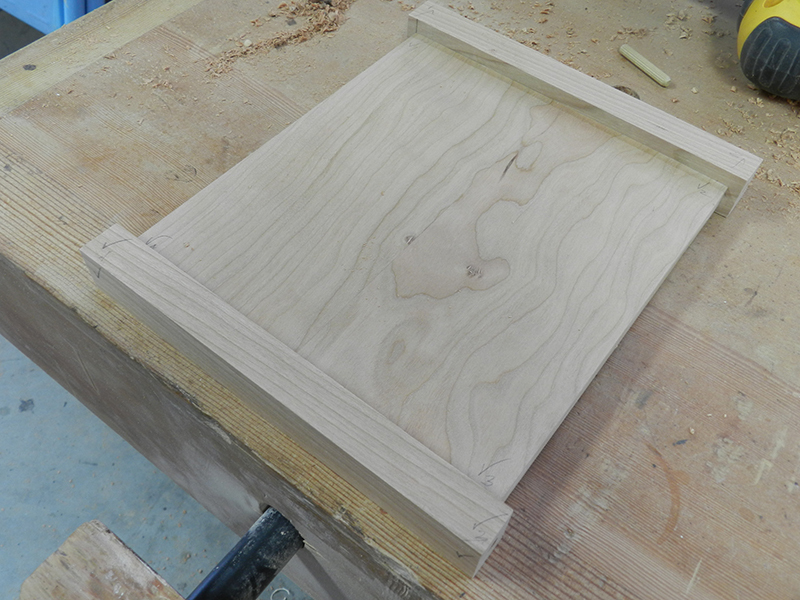 The two work pieces with jointed edges for the main section of the top plate fitted together. Preparing the top 2 inch strips: Once the 4 perimeter strips have been routed to create the decorative edge, references are marked to attach the rails to the centre core. 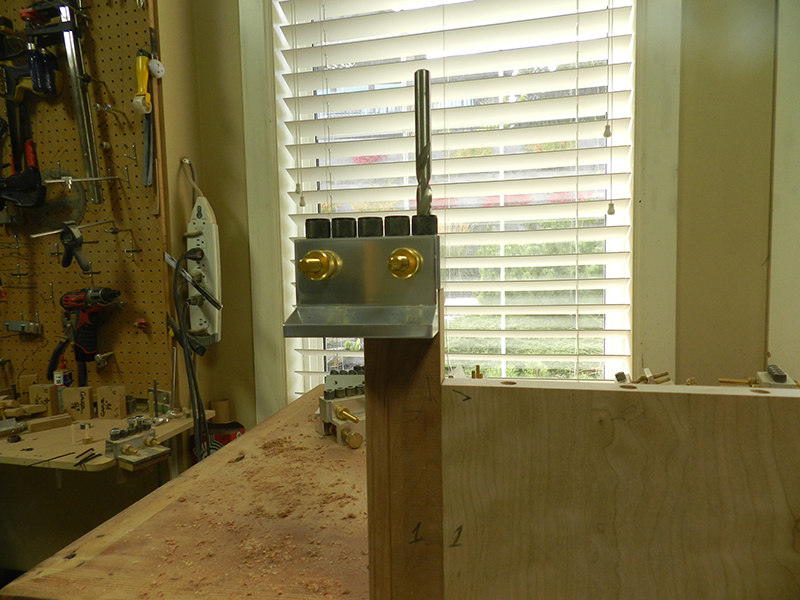 The 4 corners are mitred attachments, and since the rails are 2 inches wide, 2 inches have to be left on each end of each rail to cut the mitre. Align the rail to the centre core, leave 2 1/8 inch projections at each end, and mark one reference end. The top plate perimeter rails shown marked to indicate intersection with the center core section. NOTE: Dowelmax will be aligned to the corner of the centre core and to the vertical reference mark on the rail. Reference to the edge of the centre core plate, drill through guide 3, use the index pin, then drill through guide 5, use the index pin again and drill through guide 5. Repeat the process on the adjacent rail, aligning to the check mark and vertical scribed line. Partial assembly before cutting mitres. Plant stand top plate center core and perimeter rails partially assembled before cutting rail miters. Erase all vertical marks on rails, dry fit each rail separately and using a finely pointed pencil, scribe new marks at the junction between core and rail. The centre core of the top plate is 8 1/8" x 8 1/8". The 4 perimeter rails are 2" wide. Each rail must be slightly in excess of 12 1/8" long. Install check marks and X's leaving a 2 1/8" overlap, fasten Dowelmax and drill through guide 3. Install index pin through Dowelmax into the hole and drill #5. Repeat that process one additional time. Perform the same process with all 4 rails. 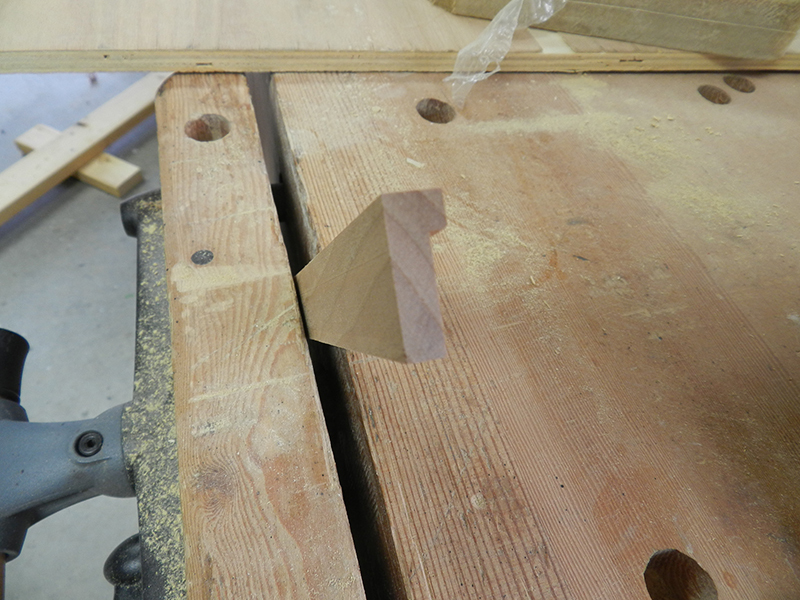 It is normal practice when doing a mitre joint, to install the dowels perpendicular to the face. This is not possible with this type of configuration, in other words, to enable assembly to take place, the dowels on 2 of the 4 perimeter rails must be on the same axis. The following is a video description of an MDF mock up but with a very similar layout. Dowelmax aligned on top plate perimeter rail to drill bores before cutting the miter. The bores for the attachment are all drilled before the mitres are cut. Mark numbers on the centre core and adjacent rail, 1 through 4. Install 1 snug dowel e.g. on rail #2, install Dowelmax to reference mark and block firmly against centre core. Slide centre core clear (avoid disturbing Dowelmax position). Drill through guide #1, ensuring bore depth extends 1" beyond mitre line. Install rail #1 with one or two dowels (only necessary to indicate reference position). 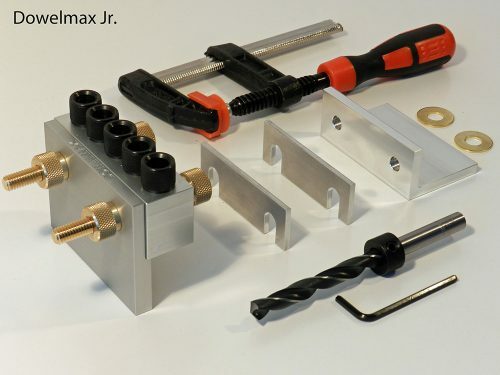 Install and clamp Dowelmax to reference mark, edge of block aligning with inner edge of #1 rail. Drill through guide #1, extending approx. 1" beyond mitre line. Repeat process for all 4 rails. 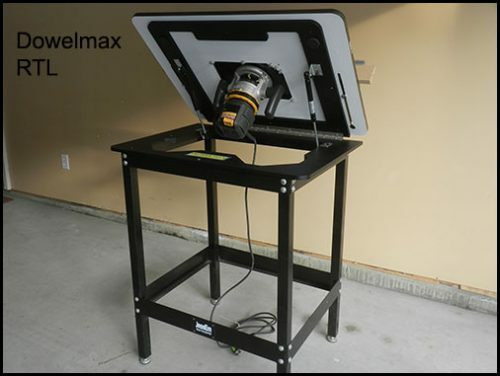 Dowelmax aligned on adjacent top plate perimeter rail to drill bores before cutting the miter. Remember, as a consequence of the accuracy of dowels, there is little room for error. 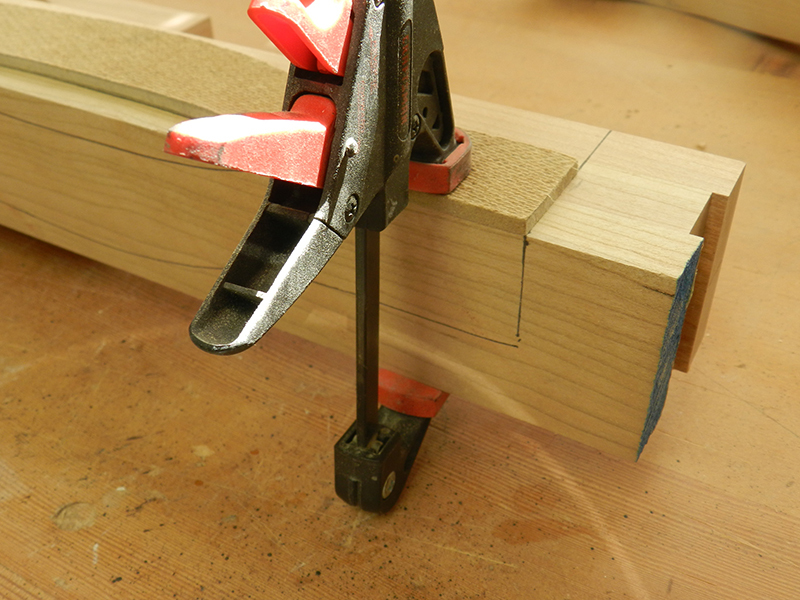 To that end, ensure that the 45's mate properly and it is wise to use a test piece for the last mitred fitting. You will recall that the thickness of the centre core is 3/4" and the thickness of the 4 perimeter rails is 7/8" to provide an overlap over the top end legs and rails. Turn the entire assembly upside down, and place the lower assembly centrally within the top plate. 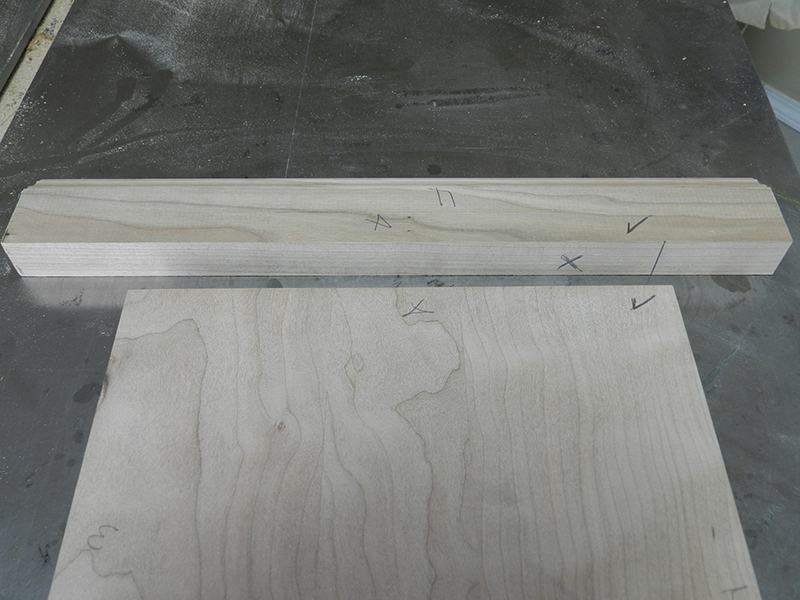 Disassemble the rail, and using the table saw, reduce the thickness of the rails at the inner section as marked. See dry fitted top plate assembly. Lower frame assembly placed upside down on top plate to mark the section to be reduced to provide overlap. Lower surface of the plant stand top perimeter rail reduced to provide the overlap connection to the lower frame section. The top plate and mitered rails partially fitted to show the orientation of the dowel connections. Route the 2 outer edges to round corners. 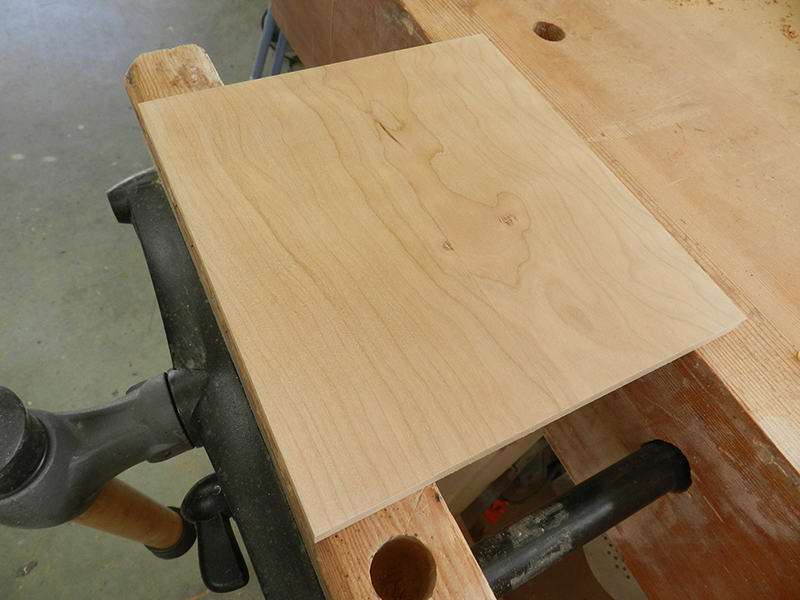 Shape of decorative moulding for plant stand top perimeter rails after being cut in table saw. 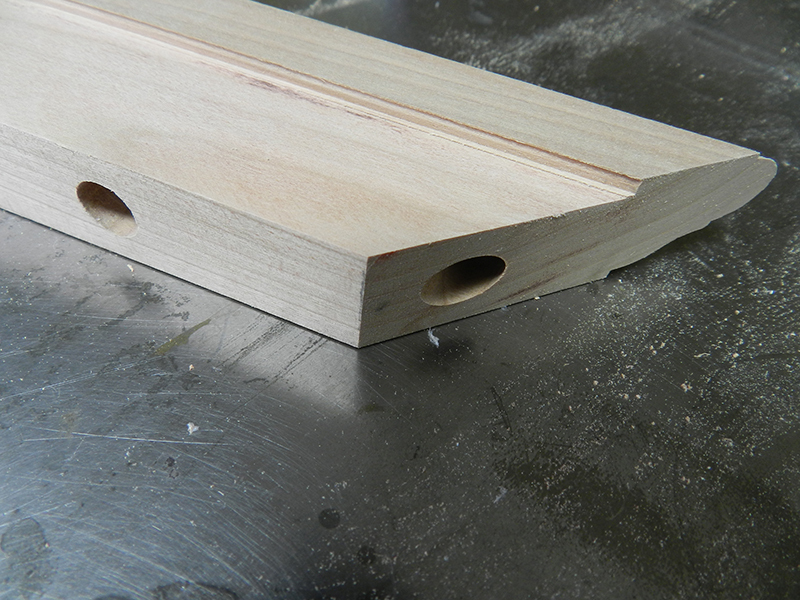 Shape of decorative moulding for plant stand perimeter rails after routing edge profile. As with other projects, I prefer to prep, stain and refinish all the various components prior to assembly. I began with the cabriole legs, drilled the small dimple at each end, re-sanded the surfaces to 220 and covered the dowel holes and joint surfaces using painter's tape. Finishing stand used to prep and stain plant stand components individually prior to final assembly. Apply a liberal coat of 3 to 1 methyl hydrate to shellac with the grain, rub in and allow to dry overnight. Prep surface using superfine steel wool, then apply a coat of Dark Walnut (or stain of your choice). Leave overnight. Apply a mixture of Dark Walnut and Espresso, ratio 1 to 1, then leave overnight. If required, apply an additional coat of Espresso gel coat stain, rub in and remove excess, with the grain and again, leave overnight.